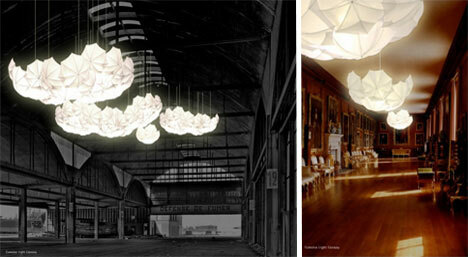 Gone are the days when lighting was a background feature designed to showcase the rest of your home. Now, thanks to material and technological advances such as new forms of affordable, versatile LED lighting, the way you light your home has become just as important as what’s being illuminated. These 20 wildly unconventional examples would hog the limelight in any home. 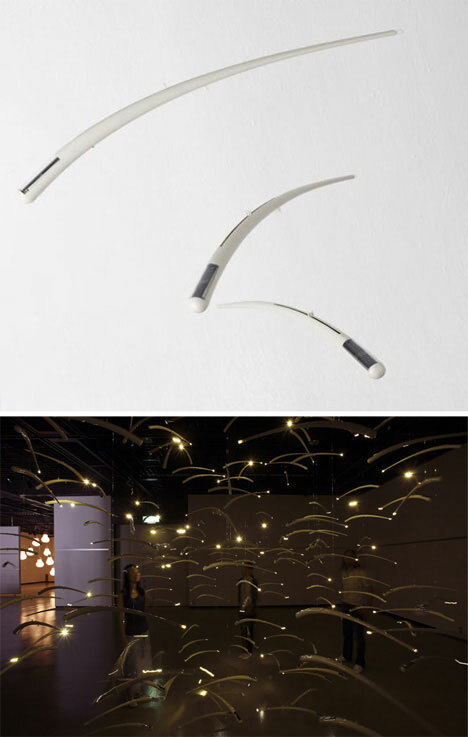 The natural world is clearly the inspiration for the Arbre branch-like lighting system and the Akiko pendant light. You build the Arbre yourself, fitting its sections together until it’s winding up your wall or across your ceiling in exactly the way you want it to – while the metal and glass Akiko should probably be housed somewhere just out of reach, in case someone’s feeling peckish and tries their luck. We are generally heavy-handed when it comes to outdoor lighting, hence the problem of light pollution. 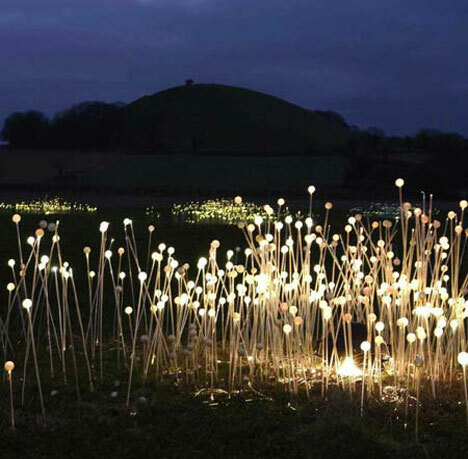 This gorgeous alternative is the work of Bruce Munro, and is formed of acrylic tubes containing optical fibers – fields and fields of them. The design is currently being showcased at the Eden Project in England, but as soon as it’s an affordable option in the marketplace, expect to see these glowing softly in every garden. Maybe there’s such a thing as imitating Nature a little too much. The paper and textile Cocoon lampshade from Julie Roberts looks for all the world like it is the remnants of something that scuttles on rather too many legs. If you’re comfortable with feeling like something could leap out from behind the sofa at any moment, it’s a gorgeous centrepiece to any room. 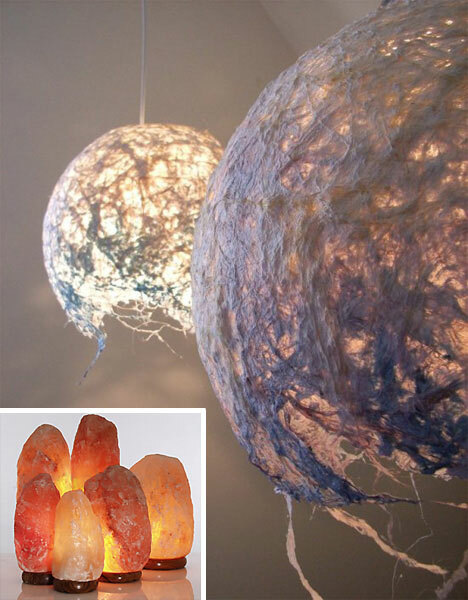 Rock Salt lamps will also look strangely familiar to movie buffs, or those familiar with Temples of Doom. Well. 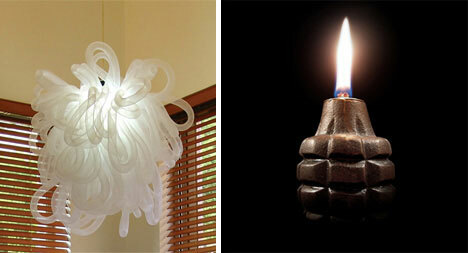 All we can say is that some designers have a rather ghoulish sense of humor. 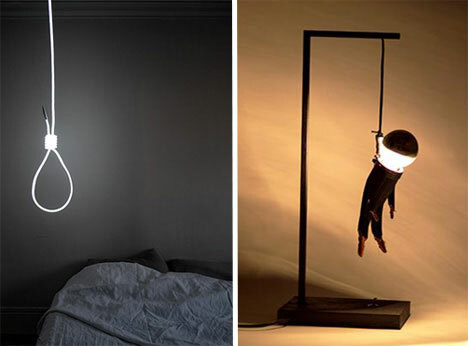 If adding the “soothing” ambience of a gibbet tugs your rope, then the Suspension light and the Colgao table lamp will grace your home nicely. If you have teenagers with angsty tendencies, best avoided. The inspiration for the Cumulus lighting system is obviously the kind of summery day where you lay on your back, watching feathery clouds scud across the sky. Steven Haulenbeek’s method of cloudmaking is to string clusters of white umbrellas together, backlighting them and hanging them upside-down – and as you can see, it works beautifully. Man’s best friend? 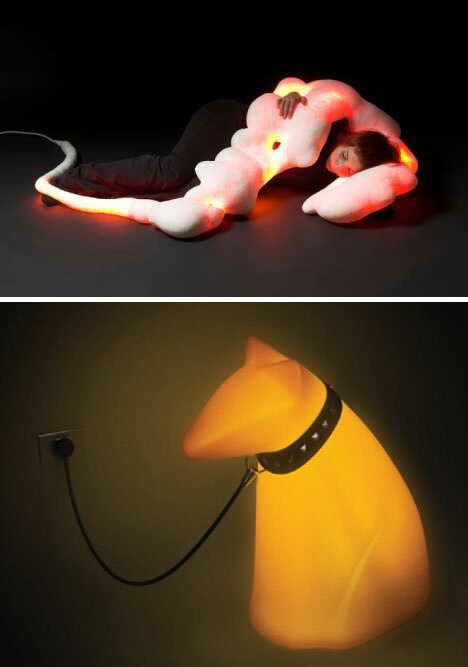 That’s the idea behind the Lightmate heated and illuminated body pillow, designed to be hugged and wrapped around the wearer / user. It certainly is a striking design – Trendhunter compared it to a length of intestine – and there’s no denying its practicality, but perhaps something that looks a little less…biological? 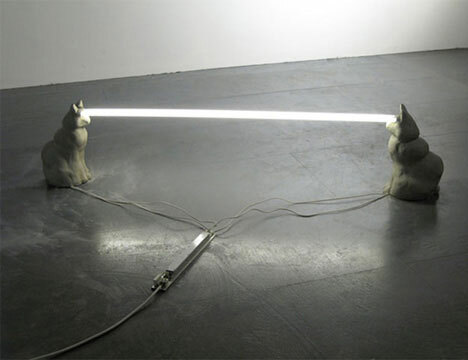 On aesthetically safer ground is Nicolas Gonzalez Garrido’s Guide Dog Lamp, which lights up when you whistle for it. It’s impossible to outstare a cat – unless you are another cat. 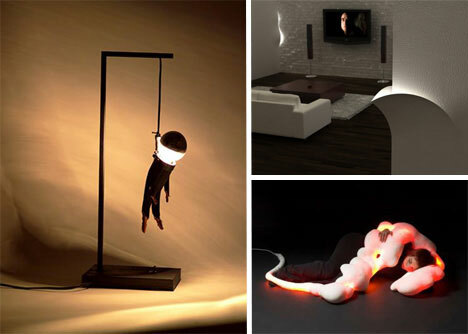 Steve Bishop has fashioned a quirky floor lamp out of a feline staring-match. Lay your bets on the winner (and be sure to watch your feet when you move around). Kaboom! The name of this lampshade suggests it will blossom into pieces at any moment, but belies its construction from stretchy loops that spring back into place when you’ve pulled them. With a far more evident explosive vibe, the Grenade Oil Lamp was once indeed a US grenade (surplus), now rendered perfectly safe and hollow. Make sure you neglect to tell your house-guests this fact, and watch their faces when you light it. 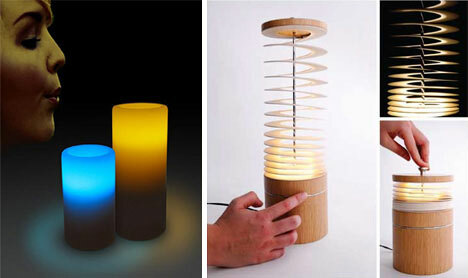 No, these lamps are not candles, but you treat them much the same way. When you’re finished with your Bi-Color LED Light, blow across the top of it to snuff it out. 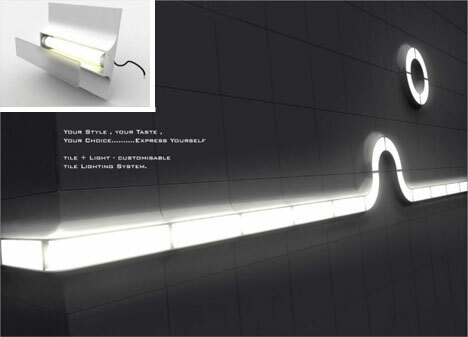 The Curly Sue imitates a different form of lighting, the dimmer switch: by adjusting the light-reflecting spiral shade you control the lamp’s brightness, and when you’re done, you press it in like a cafetiere. 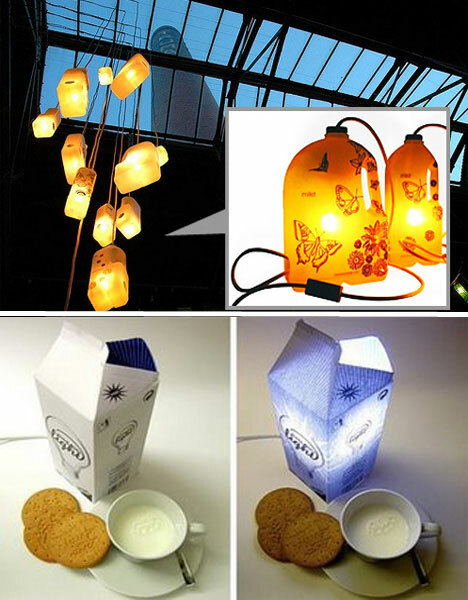 Some designers look at milk cartons and see lampshades. If you’re regularly beset by the midnight munchies, or go to work at a truly hideous hour of the morning, the Atomic Factory Milk Carton lamp belongs on your kitchen table. Taking the idea and running with it are Play Design’s Alexandru Adam and Steven Koch – they supply all the components you need to turn your used plastic milk jugs into fashionable and practical lighting with an unambiguous environmental message. This glowing sea of plastic ribs is called the Mobile Lights system. Each LED-studded unit contains solar cells that soak up the sun’s energy during the day and emit it during the evening, hung from the ceiling with tough nylon fishing line. No external power source needed – and the reflection in your windows should look fabulous. Hanging in the middle of the room looks spectacular, but if you want your lighting to be as unobtrusive as possible, Torn lighting might be just the thing you’re looking for. Each of the LED units is designed to be camouflaged as part of your room, giving the illusion of the wallpaper peeling back to emit a steady glow. The three designs are winingly titled “Hangnail”, “Dog Ear and “Crevice”. And lastly, designer Hyomi Kim has rethought bathroom lighting (always a tricky topic, as the bathroom is the last place you want lamps balanced on shelves). 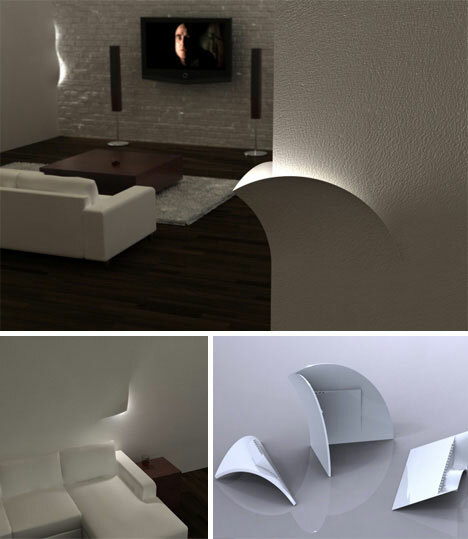 As with the Torn system, Kim’s approach is to build the lights directly into the wall in the form of strip-lighting that runs along the edge of tiled surfaces. If you’re feeling creative and a little narcissistic, the range of shapes on offer should allow you to spell out your name!